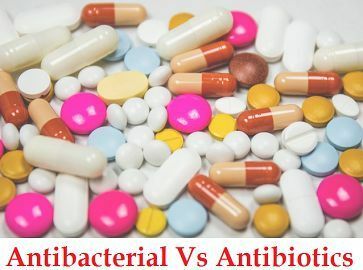 As anti means ‘against’ and bio means ‘life,’ so antibiotics are considered as one of the most important class of drugs of which antibacterial is one of most important. Penicillin was the first antibiotic discovered by Alexander Flemming, later on, other drugs like Amoxicillin, Cloxacillin, Cephalosporin, Aminoglycosides were synthesized. Antibiotics and Antibacterial can be obtained naturally, synthetically or by semi-synthetic mode. All of them differ in their mode of action where some drugs inhibit the synthesis of the cell wall, while some restrict the production of the protein of harmful microorganisms. So before taking any drugs, one should consult healthcare professionals, and it’s necessary to know about the kind of infections occurred, as Antibiotics and Antibacterial are non-functional on the viral infection. Meaning Antibacterial means such products which specifically acts on bacteria and kills or inhibits the growth of bacteria. Antibiotic refers to the metabolic products produced by microorganisms (bacteria and fungi) to kill or inhibit the growth of other microorganisms which are harmful to the body. On what it works They work only on bacteria. Their action is on fungus and bacteria. Antibacterials are the agents or compounds used to either kill or inhibit the growth of only bacteria which infect the body. Antibacterial agent can be of two types: Bacteriocidal and Bacteriostatic. Bacteriocidal are the metabolic compounds which kill or completely destroy the harmful bacteria; Bacteriostatic inhibit the growth of bacteria. Many kinds of drugs are produced like Cephalosporin(isolated from fungus), Penicillins, Tetracyclines, sulfa drugs and fluoroquinolones.The antibacterial agent is now found in products such as deodorants, mouthwashes, soaps, cutting boards, and baby toys. Antibiotic is best if that drug has low toxicity to humans and does not show side effects like allergy, drug resistance. Antibiotic are said to be those metabolic products produced by microorganisms which are used to kill other microorganisms. Antibiotics are the drugs used against bacterial and fungal infections and are used to kill or inhibit the growth of bacteria. Antibiotics differ in their mode and site of action, for example, few antibiotics are capable of inhibiting the cell wall synthesis of bacteria while other inhibit the protein synthesis. Antibiotics can be antibacterial like Bacitracin or can be antifungal like Nystatin. Antibacterial compounds inhibit or restrict the growth of only bacteria; Antibiotics are the compounds produced by microorganisms and used to kill or inhibit the growth of other harmful microorganisms. The activity of an antibacterial agent is restricted to bacteria only, but antibiotics act upon bacteria and fungus. The era of antibiotics started in the 1920s when Alexander Flemming discovered the first antibiotic ‘Penicillin.’ Narrow Spectrum and Broad Spectrum are the two categories of antibiotics and antibacterial, where narrow spectrum affect is limited to the small range of microbes, but broad-spectrum antibiotics affect a wider range of microbes. Both of these drugs can be obtained naturally, semi-synthetically or synthetically. Should not subject to development of drug resistance. Remains active in body fluids and tissues. Quick in action to the infected site. Does not show any side effect. The anti-infective therapy revolves on three factors which are: drugs, kind of causing microorganisms and infective host. Hundreds of drugs discovered till date used against the action of harmful pathogens to the body along with different working. But their main function is to destroy the infective agent without harming the host cell whether it’s an antibiotic, antibacterial, antiviral or antimicrobial.